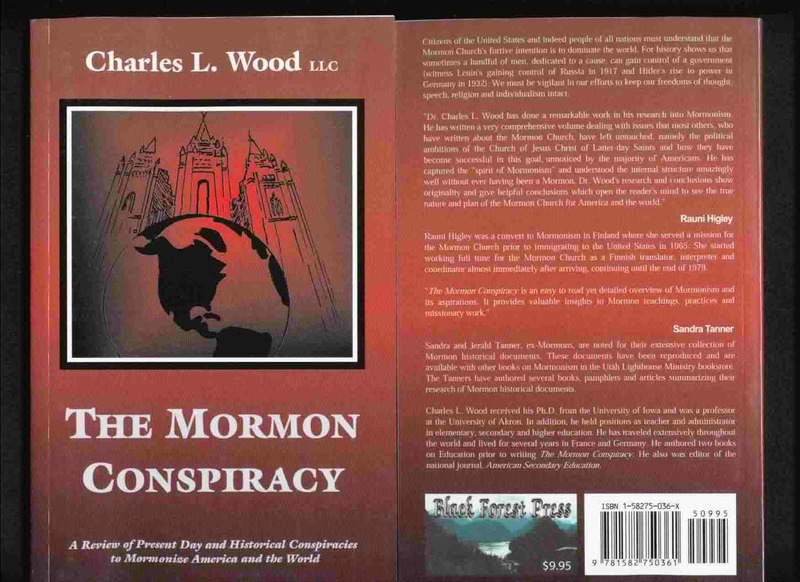 "The Mormon Conspiracy", written by Charles L. Wood, is a book about a new world religion that was created in America called Mormonism. This new religion was shaped by Joseph Smith, Jr. after he, with his scribes, wrote a book, called the Book of Mormon. The Mormon Conspiracy reviews documentation that reveals the fraudulent nature of this new religion that Mormon Church leaders claim is the only true religion on earth. This Mormon religion began its history with a conspiracy by Joseph Smith to fool his followers that his new religious book was the divine work of God. This deception of Smith has been continued to the present day by current church leaders by numerous activities and projects including glorifying and institutionalizing Mormonism including suppressing non-faith promoting documents and teaching members not to read such materials. The Mormon Conspiracy reveals the church’s beliefs and doctrines (mostly written by Joseph Smith, the church’s founder and first president) that are fraudulent. It is important to consider the condition of life for the New England people during the time of Joseph Smith as this provided the mechanism for the invention of a new religion. The economic existence for the vast majority of inhabitants was wrestled from the land that was rocky, infertile and hilly. It was, to say the least, a very rigorous life with little opportunity for improvement of one’s place in life. Life expectancy was very short, with a high mortality rate of infants and children. In short, the people were ripe for accepting a religion that promised them eternal life in a blissful and harmonious “after-earth-life” that would include family members who had died at a young age. In many cases, parents were fearful to become too attached to their children since death might take them away. Because of this constant threat of death, the development of a religion that promised eternal life would thrive. The religion would flourish especially if its inventor was a leader with charisma, intensity, great imagination, intelligence and hypnotic skill in controlling his followers as was Joseph Smith. He was the one who could build and develop his religion by convincing the Saints that with faith in God and by following his commandments, death on earth would be followed by eternal life in Heaven. Not only was this written in the Book of Mormon, but Smith’s remarkable imagination used in his sermons, writings, and the construction of his beautifully designed temples, gave his Saints a glimpse of what life might be like in Heaven. The white veil, elaborate fixtures and the luxurious decor of the numerous Mormon temples certainly emerged from the fanciful and dreamy mind of Joseph Smith. The temple indeed represented Smith’s Heaven on earth. The story of the building of this new religion is often characterized with Joseph Smith’s riding away in the night to escape the wrath of non-Mormons who believe that he and his followers have swindled them, or because of their activities which they (non-Mormons) found to be oppressive and offensive. One example was in Kirtland, Ohio, where Joseph Smith had developed a large following, established a bank, built a temple and acquired large numbers of properties. Due to the failure of his bank, he was forced to leave town by militant bank depositors, who were trying to get their money out of his bank. Many non-Mormons were also upset that Smith and his followers inflated the price of the land, which made it difficult for them to buy. This new religion taught that the natural order of things is a patriarchy and that men are the ones primarily responsible for the administration of the universal order. A woman's role is to bear children and provide support for the administration of this order. Since women do not lead, but follow, they must be connected to a man through an official church “sealing ceremony.” This allows them to be eligible for the highest degree of glory and exaltation, where they can give birth to their own "spirit children." In the early church, it has been said, while not true, the number of women exceeded the number of men. And because of this, Joseph Smith, Brigham Young, and many others used this as an excuse to take plural wives until the U.S. federal government banned the practice. Joseph Smith’s religion had three main kingdoms of heaven, the celestial, terrestrial and telestial. Those who accept the teachings of the Mormon Church and remain faithful reach the Celestial, while those who do not accept Mormon Church teachings while living, but do so after death reach the Terrestrial kingdom. The third kingdom of heaven, the Telestial, is reserved for persons who committed adultery, murder and were social misfits.